I've just taken delivery of a limited number of some gorgeous new packaging. These white 150ml polypropylene airless pumps are the perfect way to package your lotions, creams, and gels. Airless technology means your products are cleanly and hygienically dispensed. Great for air and oxygen-sensitive products, and exceptionally user-friendly. 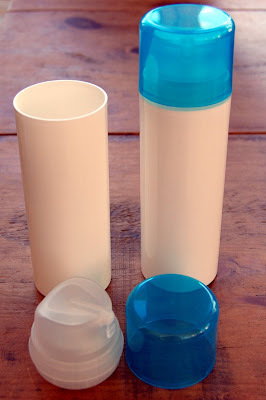 Each unit comes with a cylinder, pump, and a beautiful blue dust cap. They can be found in our Special Offers section. Supplies are limited, and we won't be adding them to our regular line, so please stock up! Oooh, THAT IS a beautiful blue color. I like very much. I have to say, I'm a sucker for blue packaging. I always love blue and white. This is perfect. I like them, too! I thought they might be nice for special Christmas packaging.